Products for automating installation of operating systems and applications have been on the market for years now. However these products have not been optimized for deploying Terminal Server environments, mostly because the crucial starting-point of a Terminal Server environment, called the chronologic installation order, was not supported. With the growth of Terminal Server environments, a few specialized installation products for Terminal Servers have recently been introduced, which support the chronologic installation order rule and enable an easy installation of the well known Citrix Presentation Server software. One of the pioneers in this product range was visionapp with their Platform Management Suite. visionapp products provide central management to application delivery infrastructures based on Microsoft and Citrix technologies, with the goals of increasing efficiency, stability, scalability and compliance. visionapp's Application Delivery Management Suite 2008 (vADM 2008) consists of two products: visionapp Workspace Management 2008 (vWM 2008) and visionapp Server Management 2008 (vSM 2008). vWM 2008 provides effective administration and deployment of corporate applications to a range of user groups through a web-based portal. The product enables access to Citrix Published Apps, Microsoft RemoteApps, Softgrid Streamed Apps, Citrix Streamed Apps, locally installed Windows Apps and Web Apps. vSM 2008 provides standardized and reproducible build and operation management of centralized application delivery environments including Terminal Server, Citrix server, hosted desktops, web server, database server and standard servers. This increases consistency and stability, and helps enable ITIL-based change and release management. In this review, I will take a look at the visionapp Server Management (vSM) product. This product is created to automate the installation of operating systems and applications and the ongoing operation management and configuration of the infrastructure. As mentioned earlier, vSM can automate the installation of operating systems and applications. The product is built for Terminal Server environments, so the delivered templates are based on such environments, providing installation sets for Terminal Servers, Citrix Presentation Server, IIS Server, Citrix Web Interface and visionsapp's second product, Workspace Management. But logically, you can easily create more server roles if you create your own installation sets based on the current templates. For deploying the Operating System, vSM requires the use of a separate deployment product. In this 2008 version, the product can use the following products: Microsoft Automated Deployment Services (ADS), Microsoft Windows Deployment Services (WDS), enteo Operating System Deployment, Fujitsu Siemens Computers Remote Deploy and/or Altiris Server Management. Personally, I think the Microsoft solutions will be used, mostly because they are available within the license of the Operating System and visionapp has added additional functionality to these solutions. The other solutions are other commercial products, where some of them are delivered together with the server hardware for a small amount. Microsoft ADS was the basis of the previous versions and visionapp extended this platform in such a way that you do not have to perform any configuration or actions within ADS. 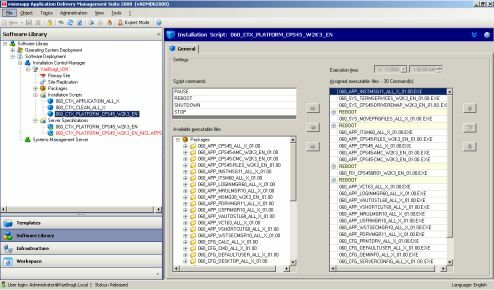 Everything is done out of the console of vSM (this is different in comparison with earlier versions). WDS is a new supported platform and because of that I used WDS for this review. So in the installation phase, you need to install the deployment supporting product for the operating system installation. 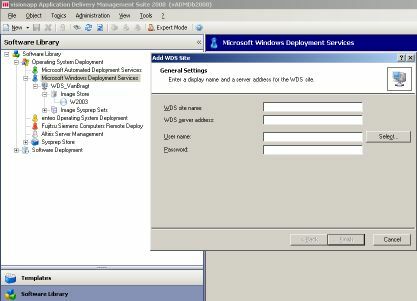 In my case WDS is available as separate download or embedded in Service Pack 2 of Windows 2003. 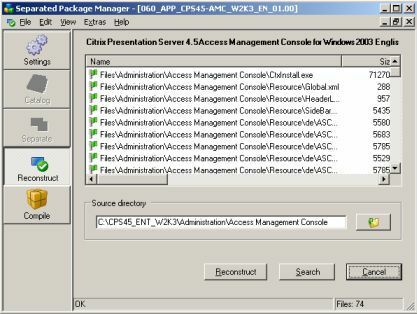 Within SP2 based Windows 2003, the WDS feature is enabled using Add/Remove Programs. 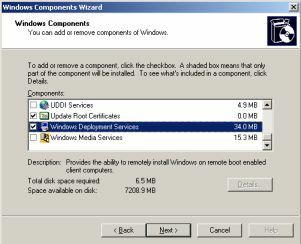 If you are using one of Microsoft deployment solutions (and probably for more OS deployment products) you need to install the Windows Automated Installation Kit to prepare a Windows PE boot image. This product can also be downloaded from the website of Microsoft. The product can be installed on the same machine as WDS/ADS or on a (temporary) other machine. visionapp's package templates are based on Wise packages (because these are most commonly used). Because of legal reasons, visionapp cannot deliver full packages (which would include the full installation resources), so they deliver the packages in a format that need to be reconstructed and compiled again before they can be used. More information will follow later on this review. To accomplish this, the Wise installer needs to be available. So this product needs to be installed on a machine. On this machine, you also need to install the visionapp Toolbox setup. This toolbox is a set of useful tools and also includes some additional components needed for reconstructing and recompiling the packages (existing of an addition to the Wise installer and a GUI for reconstruction and compilation). Remember that you install the Wise product before you install the toolbox, otherwise the Wise extension will not be installed. On the same machine you also need to run the visionapp Installation Packages executable. This executable consists of the package templates. During the wizard-driven setup, you select which operating systems you would like to use (Windows 2003 and Windows 2008 in different versions and languages) and server roles (like Terminal Server, Citrix Presentation Server, ISS, vWM, Web Interface and so on). Finally, you need to install the heart of the product, the visionapp Application Delivery Management Suite Console. 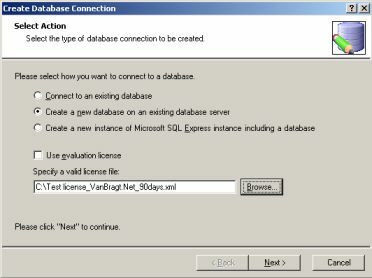 The console requires .NET Framework 2.0 and a database on a SQL Server (SQL 2000 SP3 or SQL 2005 [Express]) to function. The installation is straightforward and will, through the wizard, automatically to connect to a database. The product can create the database (with specify an account with the needed privileges) or use a database already configured by the SQL administrator. In this console also the licenses of the product are maintained (a 30 day standard test license is available within the installation). This part can be fully and automatically installed using MSIexec parameters. After the database is created, the product is ready to be configured. The first step is to create the image for the basic deployment of the operating system. As mentioned earlier, no additional configuration (except creating a PE image) is necessary for ADS. For WDS, some additional steps need to be taken to prepare WDS to be used with the vADM console. This process is described step by step in a separate manual for WDS. The ADS configuration is available in the online help only. In my opinion, you must to have at least medium knowledge of these products to understand the techniques behind the products in case you need to troubleshoot issues. Within the vADM console, a site needs to be configured for WDS within the Software Library component of the console. When the console presents the Operating System Deployment option, you choose the deployment solution, followed by a right click on that option to create the site. If the site is configured, the next step is switching to the Infrastructure component. In the infrastructure, you need to create a farm. In summary, this farm is a collection of servers, normally mainly based on a Citrix Presentation Server Farm or a Terminal Server Group. (More information about this Farm option will follow in the next paragraph.) Within this Farm, a new server will need to be added. This server will be a preconfigured server with the operating system installed, which will be used to create the image. The console can contact the server by name, IP address or MAC address. If the server is added to console and discovered, the WDS tab will be available when the server is selected in the console. Therefore, the component should be placed in the Edit Exclusively mode, because the vADM console can handle multiple administrations simultaneously. In the Edit Exclusively mode, there are no issues with simultaneous editing. First choose the WDS site name which will be used to store the image and specify the name of the image followed by pushing the Capture Image button. The process will sysprep the machine, reboot the server and use WDS and Windows PE to create an image. To accomplish this, the server should logically PXE boot to WDS. Remember that Windows 2003 capturing has some additional requirements, like an empty password for the local administrator. After a while, the image process is finished, but you do not get a full clear message that this is completed. After capturing the image, we need to finish the process by specifying a sysprep configuration in the Software Library component to ensure the installation of the operating system is carried out fully unattended. One of the strong points of the vSM product are the preconfigured installation sets for Terminal Server/Citrix Presentation Server environments. In the installation paragraph, we already installed the Wise packager and the visionapp Toolbox to reconstruct and compile those templates of the vSM product. To accomplish this, we start the Separated Package Manager and configure the location of the wise executable to compile the packages as the settings tab. First we need to reconstruct the packages which have a third party installation source by selecting the Reconstruct button and specifying the location of the packages. The tool automatically determines which packages, available at the specified location, need to be reconstructed. For each package, you need to specify the location of the installation source, followed by the search button. The tool will determine if all files necessary are available and will display this status with flags (green: available; yellow: found but not the correct version; red: unavailable). If the files are found, the package can be reconstructed using the reconstruct button. This reconstruction process takes some time, because you need to specify the installation source, search the installation source and reconstruct every separate package. But on the other hand, it also takes time and effort to develop such packages yourselves. If all the packages are reconstructed, we can compile them. Packages that do not need a reconstruction (that contain no third party resources) do not need to be recompiled. Unfortunately, the compile option does not display whether or not an executable is already available. By compiling, the package will be transformed to an executable. If all packages are compiled, it is a best practice to keep the folder structure intact, but remove everything except the compiled executables and store those on a file share. 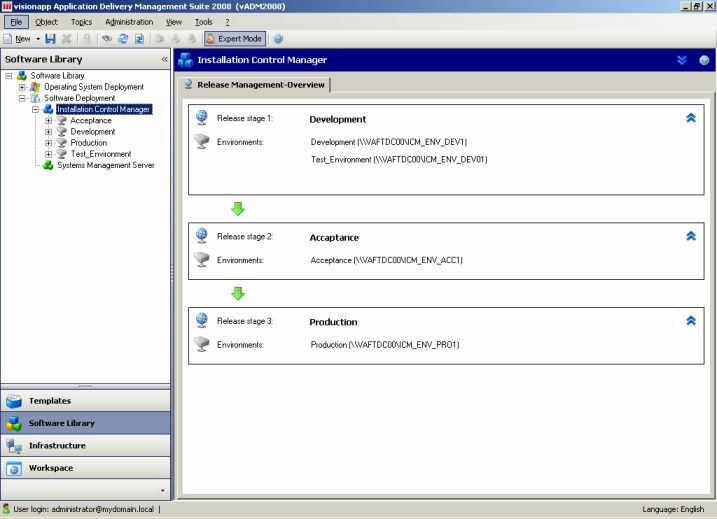 This file share will be specified in the configuration of the software deployment feature within the Software Library component of the console by creating an Installation Control Manager (ICM) environment. This ICM environment is visionapp's implementation for deploying applications to servers. vSM also supports Microsoft Systems Management Server (SMS) and Enteo Management Suite for deploying the packages. Personally, I think if you have SMS or Enteo, you won't buy vSM, although visionapp is fully capable of chronological installation order (where it is more difficult to arrange that in some of the other products). In the review, I will (logically) use the ICM environment. When specifying the file share, do not forget to check the option to import the folders and executables just copied, so you do not have to add them manually one by one. If the ICM environment is created within the console, you will see that the packages are already available in the console. The next step is to import/create the Installation Scripts. An installation script is a set of combined packages arranging the chronological installation order of applications. For the server roles, visionapp also created this installation scripts. These are available in the directory of the Installation Packages. The last step for the configuration is to create/import a Server Specification. This Server Specification is a set of combined installation scripts. A server specification will be connected to a server, causing all installation scripts to be carried out on that server. For each type of server (role), you will have a Server Specification. Now the ICM environment is ready to deploy applications to servers. visionapp has also templates of such components, which can be imported into the infrastructure. After capturing the image and configuring the ICM environment, the product is ready to deploy the servers. To start this process, we go to the infrastructure component again. Earlier we created a farm to host the server which was used to capture the image. When creating a Farm you need to specify which roles (with default values provided by visionapp) will be available within this farm and which components will be used (Operating System and Applications) to deploy the server. Within a Farm, you can add a folder and servers. When using a Citrix Presentation Server environment, a folder will represent a server group folder within the Citrix consoles. On the Farm, Folder and Server levels, settings can be configured. I'm very satisfied that visionapp reconstructed the settings in this way. It is logical that within one farm the same database settings and default Published Application settings will be used. If necessary settings which can be configured on server level can be adjusted on the folder level or even server level if necessary. After configuring those settings, we can really start deploying a server role. In my review environment, I would like to deploy a Citrix Presentation Server 4.5 farm based on Windows 2003 Server. First the server needs to be added to the farm by using the Add Server option. The name specified will be used as the Windows server name, so be sure you specify this correctly, and add the MAC address of the server so the software can identify which hardware will be configured as specified. Next, at the WDS tab (in this case, is determined by the farm configuration), the site needs to specified containing the image. At the installation tab, we specify which Sysprep set will be used for rolling out the operating system. If necessary, server-specific settings can be adjusted (like the product key) via the customize button. If the settings are configured, the start button can be pressed. The server will boot using PXE to WDS and the image will be deployed to the server. It is possible to import files that contain names and MAC address to make a bulk installation. At the ICM tab, the configured ICM environment also needs to be added. Beside the ICM environment, you can specify which site needs to be used (will be described later on) to deploy the software and, most importantly, specify the server specifications which need to be carried out. After the installation service is added to the server the defined installations will start automatically. You can schedule the installation, log off users and display a message. Currently, you cannot define a maintenance window, but this feature is scheduled for Release 2. At the installation log tab, you can follow the installation of the packages and the preview of upcoming installations. During the installation, the screen of the server will be changed to a red background, and when you login, a window will be shown that an installation is being performed. This makes it really clear that the server is in an installation mode. One of the big advantages of the visionapp solution is the collection of already prepared packages which can be downloaded from visionapp's website. As of this writing, more than 1300 packages were already available. These packages also need to be reconstructed and compiled to create the executable which needs to be imported into the vSM environment. The addition of applications works the same way as the installation packages for the Terminal Server and Citrix Presentation Server. Within the ICM environment at the Software Library, the packages need to be imported. Those packages need to be combined in an installation script. Think of one installation script per silo or combining sets of applications which are related to each other. One or more installation scripts can be added to a server specification. If you add an installation script to a server specification which is already assigned to servers, the installation script will also be performed on those servers. The chronologic order is retained, despite the fact that the server was already installed or it is a complete new installation of a server. If visionapp does not have a package available for your application you have several options. You can use the Wise Packager to create a similar script, use a MSI-based package, or create your own installation script based on VBS or CMD. Products like vSM are often used in large infrastructures where more data centers, more environments and Citrix farms are available. In this paragraph, I will describe the components and features that are available within the product for these large environments. In the 2008 version, visionapp supports the DTAP (Development, Test, Acceptance and Production) principle, which is the technical implementation of ITIL processes. Within vADM, more than one ICM environment can be created. Each ICM environment can be labeled with a release stage label. Using this method, a package needs to goes through the whole process before it can be deployed to production servers. In large infrastructures such a feature is essential, so I'm glad visionapp added this feature in their product. In situations where more data centers are involved, or lots of application installations are carried out, a single file share can have his limitations. Think of bandwidth limitations between the data centers. Logically, it is not a good idea to install a server located in the US from a file share located in Europe. Also, deploying lots of servers at once from one file share can cause issues with in-use files. To avoid such issues within vSM, it is possible to configure more distribution points (which can be selected at the ICM tab when deploying software). These sites can be synchronized using a replication service. This service can be installed out of the vADM console in the Software Library component. Another new feature which is very useful is the Compare Farm Settings option. This feature can compare the settings as configured at the Farm level within vADM with an export of Farm settings in a XML file. Using this option, the settings available in the Citrix consoles can be compared with the settings of the same Farm in vADM or settings between Farms available within vADM. Differences between the settings can be synchronized to the vADM settings, so these are reflecting the current settings of that Farm. The same component can also be used to integrate vADM in your already-existing Citrix environment by importing your existing settings into your vADM configuration instead of entering those settings by hand. Another nice feature of the vSM product is the availability to create your own custom parameters, which can be used as decision points in your installation scripts and the ability to create settings based on those parameters. Also, the default parameters supplied by visionapp can be adjusted to your needs. All those configuration settings can be made with the Templates component. Besides the deployment part of vSM, it includes several handy add-ons in the product to make the life of a system administrator easier. On the server level, a Remote Administration tab is available. On this tab, you can find options to Restart, Shut Down and Wake the machine as Remote Actions. Also other system components can be viewed directly out of the console, like the Event Viewer and Computer Management. In addition, the server can be viewed remotely using RDP or the management board (if configured) from the console. With a single click, remote logins can be disabled or enabled. At the Citrix parameters tab, you can also find shortcuts to start the Citrix Presentation Server tools like the Citrix Access Suite Console, Presentation Server Console, the Program Neighborhood and the Shadow Taskbar. There is also a tab available called Inventory, supplying a quick overview of the system resources, such as CPU, Network Interfaces, Internal Memory and Hard disks. The configurations can also be exported for a back-up or disaster recovery. visionapp also delivers a nice of additional set of extra tools in the visionapp Toolbox. It goes behind the review to discuss the Toolbox, but you should definitely check those out during evaluation. Finally, visionapp also has a good feature which automates application publishing. I really find it important that a manufacturer is adding new features to their product when releasing a new version that are really useful in various environments. 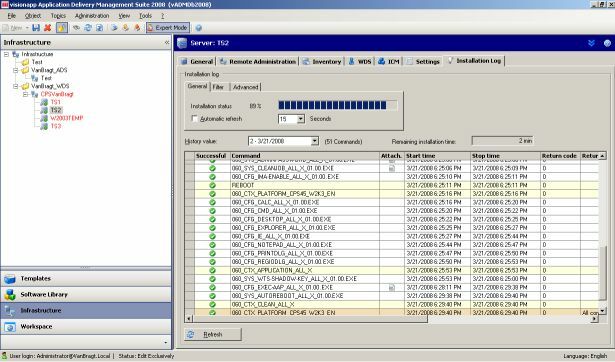 With the 2008 version, visionapp is adding several new options that are really requests from the market. For example, with the addition of WDS support, the farms settings on a global level, the replication services between distribution points, visionapp is future-ready and more scalable. Of course, the big set of predefined packages for many applications and the complete configuration of the Citrix Presentation Server Farm out of the console are still big plusses for the vSM product, because this will reduce the time needed to build and maintain a Terminal Server environment significant. In comparison with manuals of earlier versions, I find these manuals to be on a high level, which means that the learning curve is a bit higher than before. Also, the reconstruction and compiling of the packages will take some time, but with the predefined packages it is much quicker than building such packages on your own. But probably most importantly, the vSM suite is developed with the Terminal Server basic concepts as a starting point, and as such the product is completely Terminal Server ready. It is also worth mentioning that the product supports several versions of Citrix Presentation Server, already supports Windows 2008 (including 64-bit) and visionapp is continually developing new template packages (for example XenApp 5.0). Predefined templates for deploying Terminal Server/Citrix Presentation Server environments with the Terminal Basic concepts (Chronological Installation Order) as starting point. Many available package templates for applications. Scalable and ready to use in large environments with replication services and Citrix settings on several levels (with good security options like encryption transfers of passwords and license keys. Product is using a couple of third party products to function, like Wise Packager, SQL Server and an Operating System deployment solution, where also knowledge of these products is preferable. Manuals are a bit on a high level, which creates a higher learning curve. The process of reconstruction and compiling application packages can look a bit time-consuming when using it. You can use your own scripts based on MSI, VBS or CMD scripts as well, but this is also time-consuming.